Lock in a great price for Tranquility Estate – rated 9.5 by recent guests! The owner was responsive and very kind - also very knowledgeable! The property is beautiful! I couldn't believe that this gem is located in the hills of Kingston. The rooms offered a beautiful view of the mountains and were cooled by the trade winds. I want to go back and would recommend this place 100x over. I can't say how great this place is. You won't want to leave once you reach. Beautiful view. Peaceful surroundings. Owner is a remarkable woman and an excellent chef on top of it. The place really feels like home. Great food, excellent area. Perfect getaway! Lorna is an incredible host. Very knowledgeable and a great chef, breakfast was phenomenal. The views around the property are some of the best you'll see on the island. The perfect way to experience real Jamaica. The view is incredible. The surrounding hillside is very beautiful and the veranda is great for relaxing. Perfect location overlooking Kingston. It's quiet and peaceful but still a short drive to the city, main attractions and restaurants. Lorna is a great host who is very responsive and gives detailed directions and information ahead of arrival, so you know what to expect. 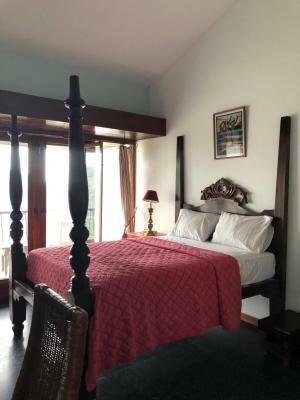 The rooms are clean, comfortable and spacious with breathtaking views of the mountains and city. We didn't get a chance to use the pool, but it was an inviting clear blue with poolside furniture. I'd highly recommend this property to anyone who is looking for a relaxing alternative to the hustle and bustle of downtime Kingston. Lorna is a great host. The view is magnificent. The food is amazing. Beautiful property up on the hillside - views are spectacular. Room was clean and comfortable with lots of room to move and place your luggage. Wifi worked great and even though the house has other guests it always felt like we had the place to ourselves. Breakfast was delicious - variety of local fruit and fried specialties - really liked the fish, plainton and callaloo served up. The garden and pool are wonderful to take some time to chill out and enjoy the lovely weather and views - definitely recommend to utilise during your stay. Lorna is a wonderful host who ensured our stay was perfect and we got the most out of our time in Kingston - she gave us suggestions on what to do/see/eat and ensured we had a knowledgeable driver to take us around during the day. Definitely returning back to Tranquility on our next visit. Tranquility Estate offers luxury accommodations in Jacks Hill. The bed and breakfast has a 300 degree wraparound terrace and views of the garden as well as free onsite private parking. All rooms have a private balcony with seating, that looks over Kingston and the hills. 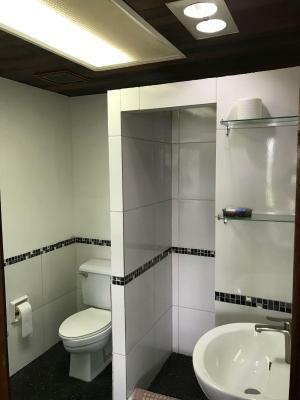 The rooms all have a private bathroom. Tranquility Estate offers an à la carte breakfast menu featuring a selection of Jamaican and British inspired dishes. There is a spacious sitting room and a library where you can relax and watch cable TV. Kingston airport is 6.8 mi, and the center of Kingston is 15 minutes from the property. Port Antonio is 22 mi from Tranquility Estate. This property also has one of the top-rated locations in Kingston! Guests are happier about it compared to other properties in the area. When would you like to stay at Tranquility Estate? 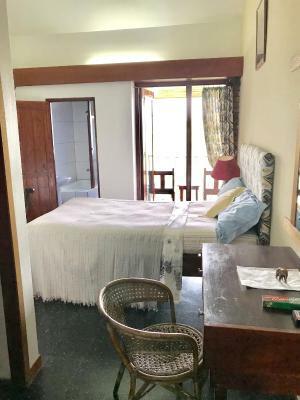 This double room has its own balcony with chairs and table, private bathroom and tile/marble floor. It has views of the hills. Deluxe Double Room has its own balcony with chairs & table with a private bathroom and tiles/ marble floor. It has views of the hills. Tranquility Estate sits on 12 acres of hillside sitting in the lower part of the Blue Mountains, we have a 320 degree veranda which enables a stunning vista. House Rules Tranquility Estate takes special requests – add in the next step! Tranquility Estate accepts these cards and reserves the right to temporarily hold an amount prior to arrival. A deposit of 30% of the total booking cost must be made within 48 hours of booking via PayPal to secure your reservation. The property will contact you after you book to provide any instructions. Please note dinner/evening meals that have to be ordered 24 hrs in advance. The road up is rugged, to say the least. After we drove the Blue Mountain track this was a breeze. Really peacefull and great view from the balcony. The hosts are very friendly and everything was perfect! Thank you for having us. Be prepared for loud music at night, it is Kingston after all, being up in the hills noise travels. I enjoyed it, but driving on Storyline, B1 and the nearby "hills" is aggressive. As usual TE didn't disappoint. Lorna as lovely as ever keeps us laughing with her easy going down to earth manner and of course the views are always absolutely breathtaking!! 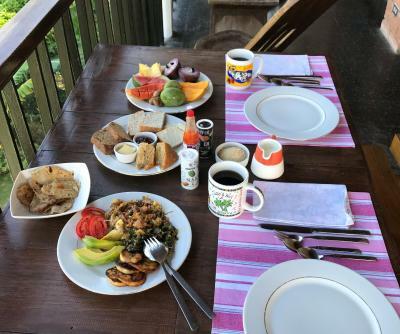 Breakfast on the veranda is always tasty and the room is always clean and comfortable. Very safe location in the hills just a few minutes from the busyness of town. Beautiful way to relax and recharge. The breakfast was delicious. Views were spectacular but not from our room. Just a wonderful experience! We are very grateful for the best breakfast we had during our week in Jamaica (with the best view on top). Also for cold beers. Our room was very cosy. We will always remember the very unique setting, including the drive up the mountain. That was a bit scary, especially the first time around but a good part of the experience. Had a lof of fun with the cute puppies. Great base to explore Blue Mountains and for Dub Club (only on Sundays). Lorna has our full respect for the way she runs this wonderful property and shares it with her guests. We would’ve liked a fridge to store cold drinks. The house, our room, the view, our breakfast, Lorna the owner. The only downside is that the hillside location makes it more challenging to get into Kingston proper. the owner is very helpful in getting rides, and at 2000 J each direction, are reasonable. however, adding 4000 J so you can get dinner at night adds up. Just something to be aware of. Beautiful views over Kingston in an outstanding mansion. Great food and the owners and their dog are just so heartwarming that you just wanna stay longer. The view is incredible! There’s no TV for entertainment, just the fireflies. The host was friendly and very knowledgeable about Jamaican culture. So close from Kingston and it feels yet so far away. What a incledible view of the city. During the day, during sunset, during sunrise, it's all great. The owner is really really nice, such a lovely lady. She made us feel so welcome! Food is served at the balcony with the great view. It was perfect, thank you! It was a bit hard to find cause google maps doesn't recognize the road. And the name of the street is 'Close road', since there are some roadworks we read the singn as 'Closed road'. Just good to know when you're driving to the hotel.